Look what my friend found at a service station near her home in Utah? I just had a to buy a flat for my next sale, no? ~ by Dawn Elliott on November 19, 2012.
please explain the title. here in yakeeland they are sold in the grocery store as candles to light in honor of some favorite saint! Loteria is a Mexican game similar to Bingo, but the cards are beautifully decorated images and icons from their culture…hearts, birds, hands, foods, etc. 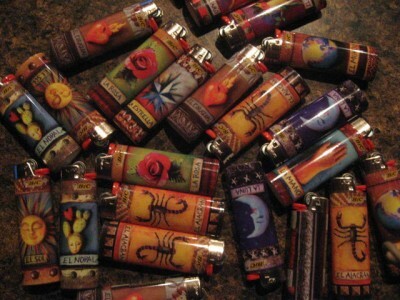 I’ve never seen them on a lighter before! Who knew?? ?